I have heard of designer chemists that would take well known drugs, change a hydrogen to a methyl group, and then see what the effect would be in people. So my question is, what happens in caffeine when these kinds of substitutions are done? What happens if you take the methyl group coming out of one of the nitrogens and make it an Ethyl, or if you change a methyl into a hydrogen? 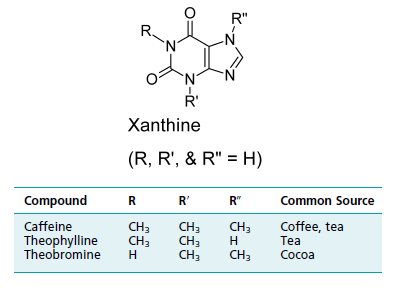 Yes there actually a few analogs of caffeine (methylxanthines). Caffeine is a widely used CNS stimulant. Theophylline has some medical use as a CNS stimulant, but its CNS stimulant properties are encountered more often as sometimes severe, and potentially life-threatening, side effects of its use in bronchial asthma therapy. Theobromine has very little CNS activity (probably because of poor physicochemical properties for distribution to the CNS). Not the answer you're looking for? Browse other questions tagged organic-chemistry drugs or ask your own question. Why are DCM and chloroform so resistant towards nucleophilic substitution?